Every now and then I get to get dressed up and go to a grown-up restaurant. Tonight was one of those nights. I drove the few miles to Baci on West Morena Blvd just in time to place my order with my five dining partners, several of whom were family members. What a menu. It started out with Antipasti ranging from $11.95 to $14.95. There were 8 different items to choose from plus a soup for $5.95. One person ordered mussels that were excellent. The broth was succulent and the baskets of bread that were on the table complimented the mussels. A second person ordered “Carpaccio Di Manzo,” a raw filet mignon, dijon mustard, olive oil, parmesan cheese and capers. He knew how good it was and did not want to share with us, so he placed an order for two of them – one he ate by himself and the other we shared. It, too, was delicious. One other appetizer ordered by a third was mozzarella and Prosciutto that was also delicious. From the five salads listed – $7.95-$13.95, a fourth member of our party ordered the Caesar salad and his date ordered the Hearts of Palm salad. Both were very good; cold and crispy. 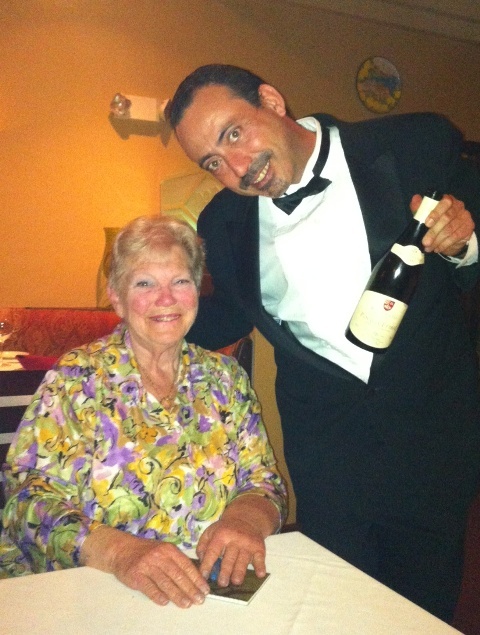 A bottle of Pouilly Fuisse Roux – that later turned into two bottles – was ordered. It complimented the meal perfectly. All of us – even this reviewer – enjoyed it. 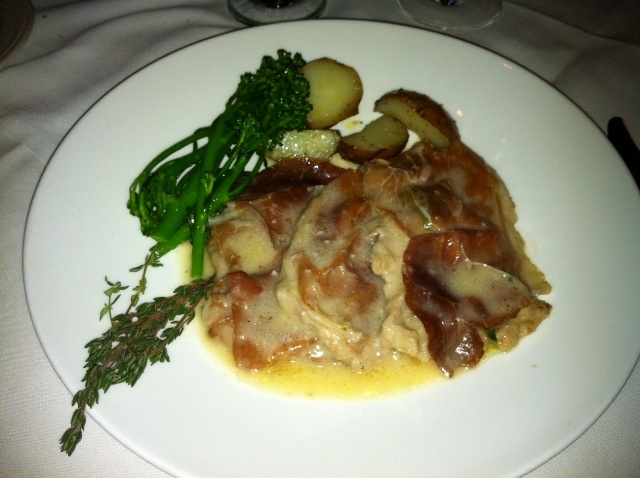 One member had one of the veal specials and he said it was delicious. 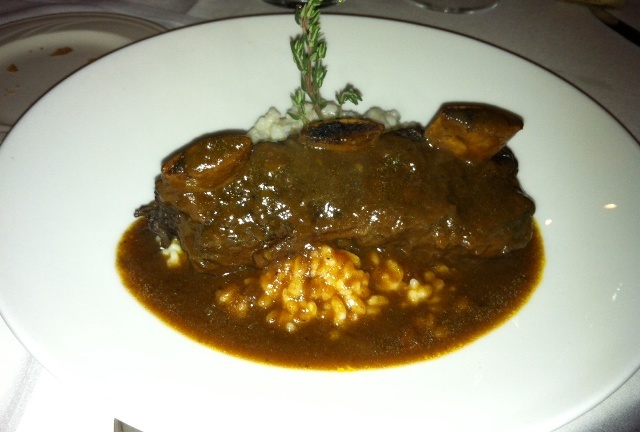 Another had the Bison short rib special that he said was cooked to perfection. A third had the swordfish special and raved about it throughout the entire meal. 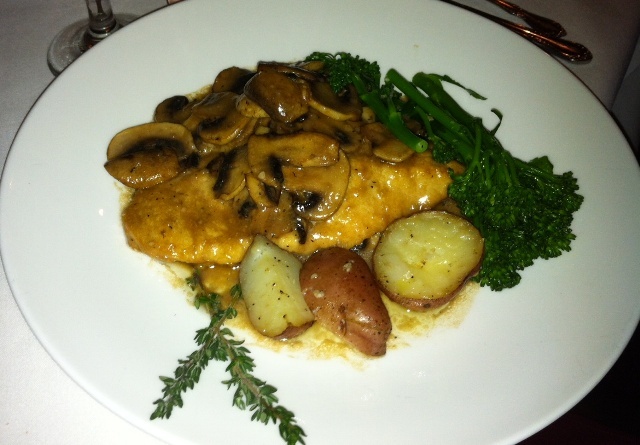 The fourth had the Pollo al Limone, a regular on the menu, and the fifth had the Pollo Marsala, another regular on the menu. 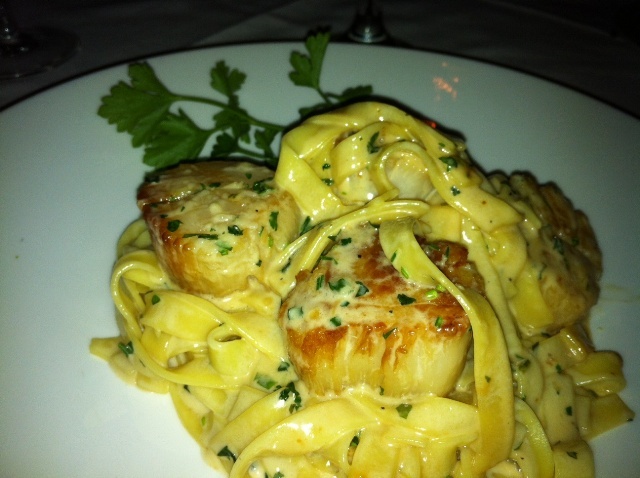 I had one of the two Scallop specials, served on a bed of pasta. Of the scallops on my plate one was quite gritty; I suspect that the sand was not adequately cleaned out of it before it was cooked. The others were fine. It is also noted that they were large scallops – 2-3 bites out of each one. I can tell you how much the two chicken dinners were – $23.95 and $24.95 , but I cannot tell you about the other meals because they were “specials” and the old adage “if you have to ask how much it costs you can’t afford it” was in operation. I fully expected to pay my share of the meal, but another person generously picked up the tab and would not tell me what it cost. I suspect, however, that it came to a couple of hundred dollars for the 6 of us. When he asked if anyone wanted dessert he heard that even though he was too full, one of our members was having his birthday and I said he should have something. Without saying anything else to us, Francesco brought the birthday boy a Tiramisu with a candle on it and we all sang Happy Birthday to him. Then, after we were finished with the dessert, we were brought a glass of port – I think it was from the menu and named “Naval Black Ruby” and was complimentary. It was wonderful and gave the meal a nice finishing touch. By the way, there are 6 items on the dessert menu, beginning at $8 for the Tiramisu and the others at $9. A Gelato was $6. 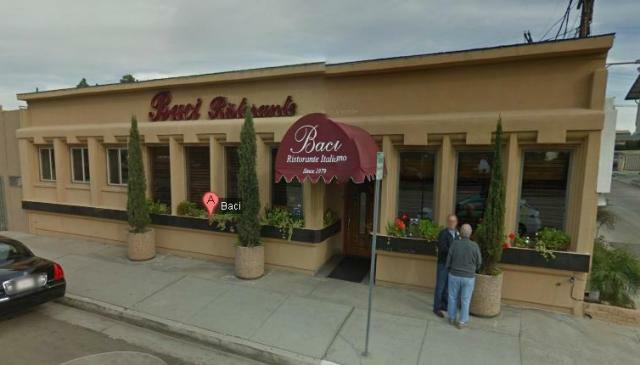 There is no doubt that the meal was out of my price range, but it was an enjoyable time and if someone were to ask me where they should go to celebrate a special occasion I would not hesitate to recommend Baci. And I should say that the entire wait staff was courteous, efficient, and delightful. I hope I have an occasion to go back. We will be trying this place out because of this review. I had never heard of this place before and I’m always looknig for good Italian food.I enjoy reading your reviews.Thanks so much! I know you will have a delightful meal. Let me know what you think. Enjoy! Had a great dinner there a few years ago myself. Don’t remember what I ordered. Service was impeccable. My friend said this place has been there since the 1940’s! He said it was a big gangster hangout back then, cool. And they have 4 out of 5 stars on Yelp..which says a lot. It was really good, Mercy. I could not afford it myself, but someday, after I find myself a rich man, I’ll be back! Judi- sounds like you had a great meal! I LOVE this place. John and I went here for our 7th anniversary last month- and it was FAB- we had the burrata, hearts of palm, he had one of the scallop plates and I had to the osscobuco. I’ve never had marrow before and it was delicious- gooey, warm and delicious. 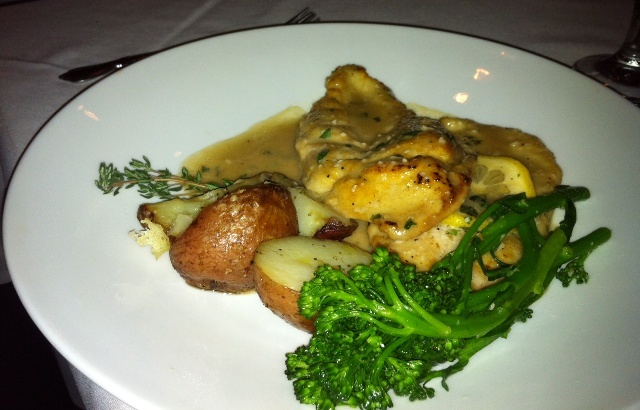 I loved that for a nice restaurant, the service was attentive but not overbearing. It’s nice to find a fine dining restaurant that gives you a substantial meal without all the fuss. It was good, Brittany. I hope to go back some day soon.